Featured here is Erastus Laban Tower. I'm including what I find about his wife and children. I'm tracking down the children of Abraham Bates Tower and his wife Nancy Angeline (Long) Tower. The basic dates and names are already recorded in my page Decendants of Abraham Bates Tower. I'm trying to fill in the details of their lives. Where did they live? What did they do? What happened to the children of Erastus and Clarvina Tower? I'll use maps showing the way this family dispersed across Kansas, Oklahoma, Texas and Indiana and links to any sources I find telling about their lives. Photo of Vina and Pearl Tower from my mother's collection. Erastus Laban Tower was born 7 Aug 1861 in Crawford, Indiana, United States. 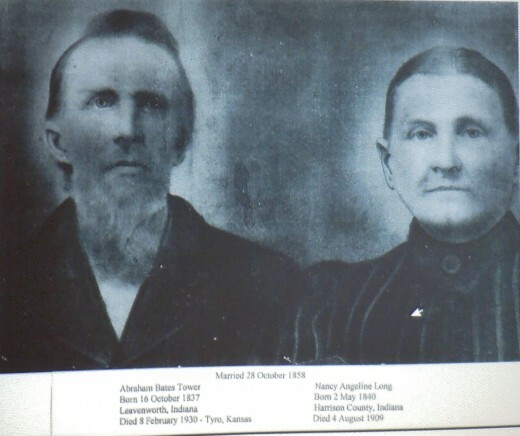 His parents were Abraham Bates Tower and Nancy Angeline (Long) Tower. He was their second child. Abraham was a cooper in 1860, the year before Erastus was born. The young family shared housing with Nancy's mother and with another young couple with an infant. When Erastus was one year old, his father enlisted in Company G, 93rd Indiana Volunteer Infantry and went away to serve in the Civil War. 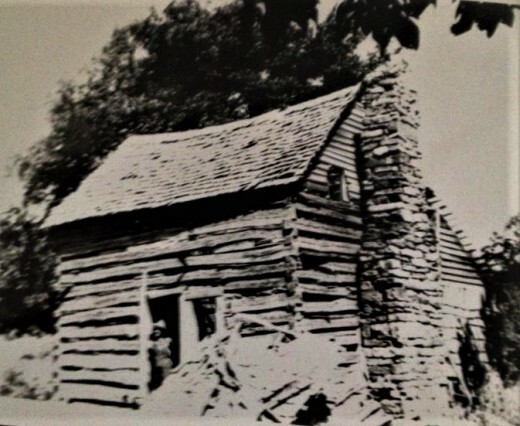 When Abraham was presumed dead after the Battle of Brice's Crossroads, Nancy Angeline Tower took her 2 children to Linn County, Missouri where her sister, Mary Jane (Long) Williams, lived with her husband and five children. 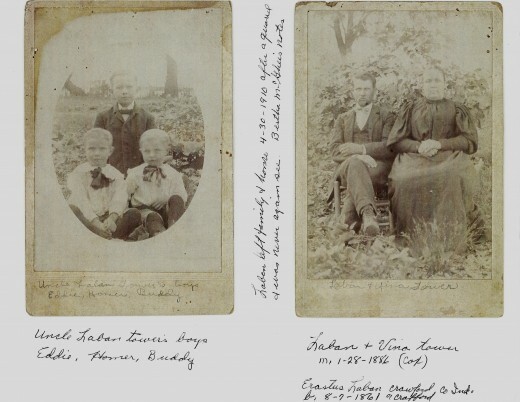 At the end of the war, Erastus' father returned to the family but was in poor health from his time in Andersonville Prison. The little boy was 4 years old. 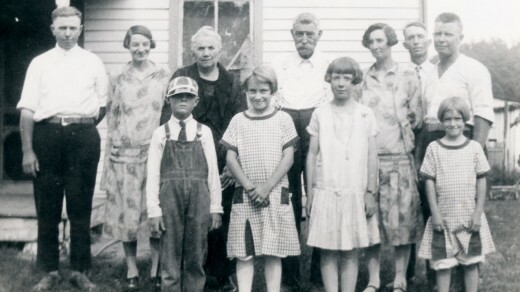 Three more siblings were added to the family, then they moved to Hilltop, Arkansas, where another sister was born. 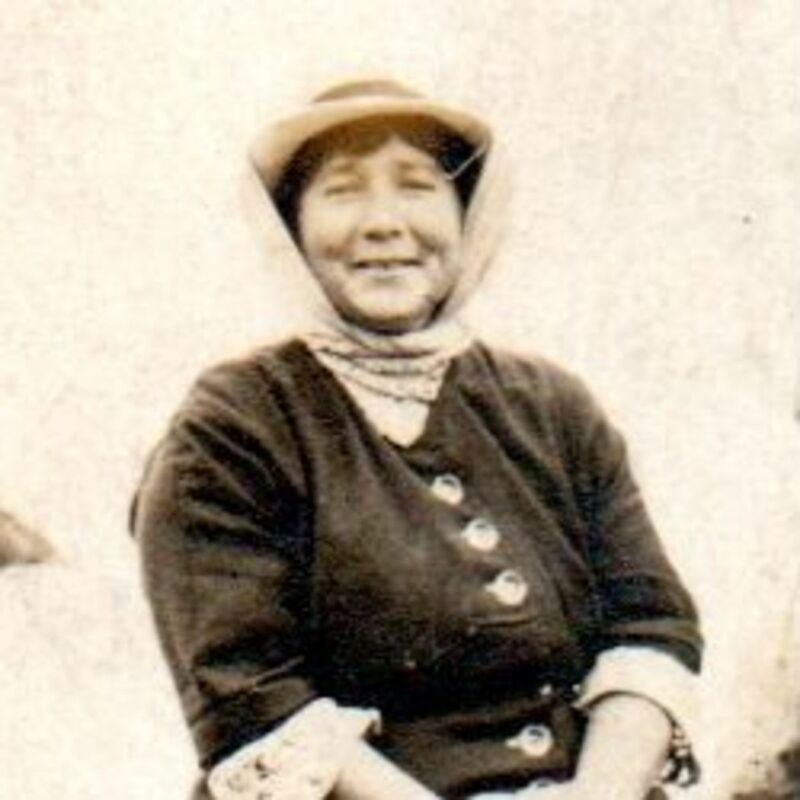 Viola Matilda Tower was my great grandmother. 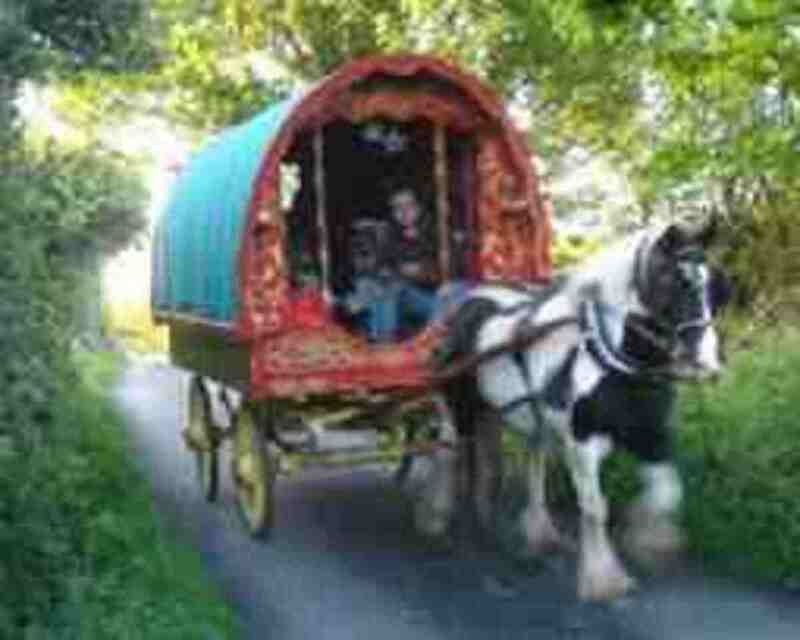 The family lived in a log house and his father herded cattle on the wooded hills. Using ancestry.com, I located the birth record and census records for Erastus. Family generally called him Laban. He was born August 7, 1861 in Crawford County, Indiana. Neither Erastus or Laban are listed among the popular boy's names of that era. Laban is a Biblical name. Erasmus was a common name, but not Erastus. 1900 - Age: 38 - Residence - Clark Township (north half), Perry, Indiana. 1940 - Age: 78 - Residence - Battle Ground, Tippecanoe, Indiana, United States. He was living on Main Street with his wife. They are listed as owning their home, valued at $5000. His wife is listed as C.V. Tower. Erastus L Tower 38. His occupation is listed as a farmer. 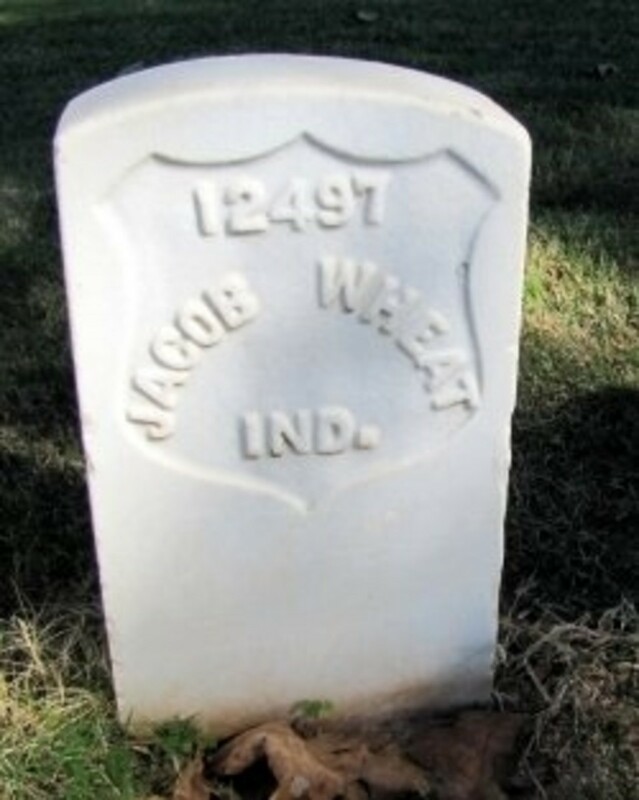 He and his wife were both born in Indiana and their parents were born in Indiana. He is listed as owning his farm without a mortgage. Carvina V Tower born July 1869, now 30. She's listed as the mother of 4 children, with 3 of them living. It shows that they married in 1886. Ann J Howard born September 1937 in Indiana with parents from Kentucky, now 62 (aunt, single). From an earlier census of the Howard family, it appears that Eliza M and Ann J. are sisters. All persons in the household are able to read, write (except for 2 youngest children) and speak English. Just four households further down in the list are George and Lucinda Cox (ages 65 and 60). Possibly more in-laws. The Tower family is quite fortunate to have this fine family history compiled by Charlemagne Tower. 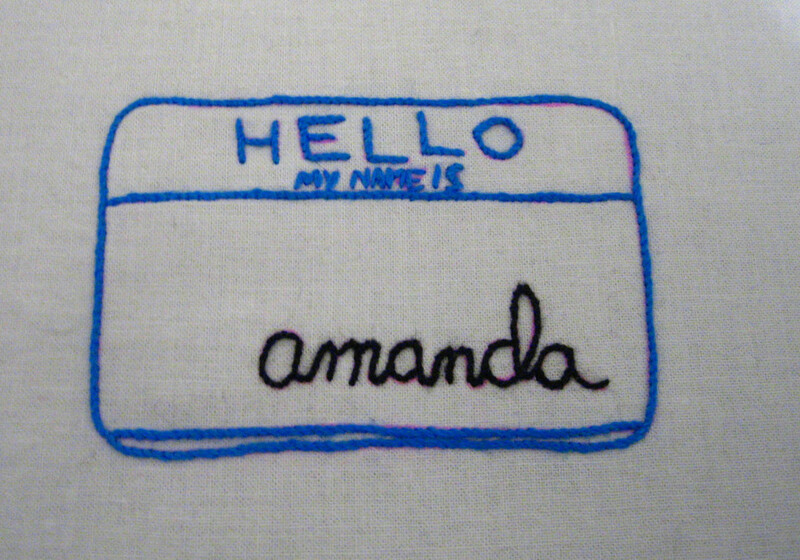 I have a copy of it but it is also available in a digitized version. Later, Volume II was compiled by Lee C. Tower. In Volume II, Erastus Laban Tower is on page 178. Volume II is not available on Amazon though. Clarvina, Carvina?? Which name is correct for Erastus' wife? Her obit shows Clarvina. Residence - Oil, Perry, Indiana. The census shows they live on a farm. It gives their age when they married as 24 and 16. It says that everyone in the home can read and write. It also shows everyone in the household was born in Indiana and their parents were born in Indiana. All are citizens. 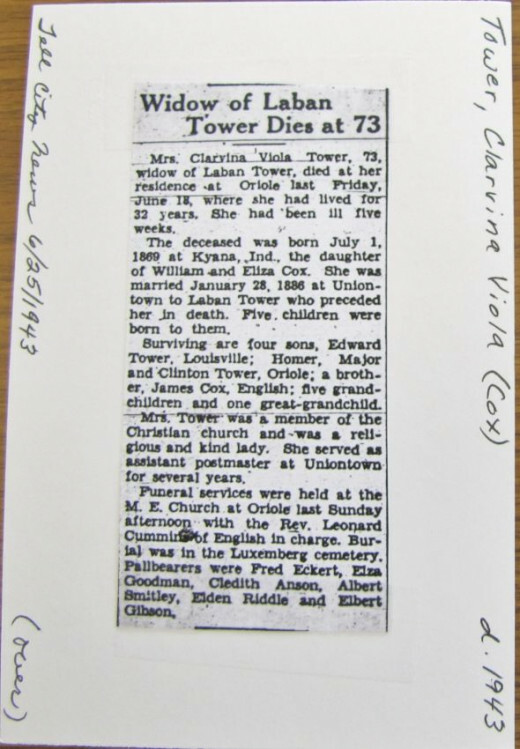 Clarina V Tower, age 60 (wife) I believe the Clarina is a transcription error. In looking at the original handwriting, it looks like Clarvina to me. Looking further down the census, I see three of Erastus and Clarvina's sons listed. The next farm over belongs to Theodore Tower (age 37) and wife Ina (age 34) and daughter Hilda Marie (age 15). Also living with Theodore and Ina Tower is Ina's widowed mother, Ruth P. Riddle (age 57). 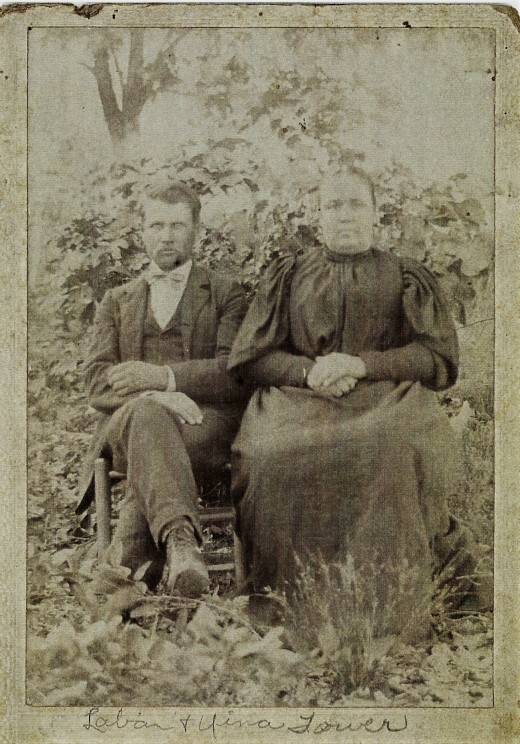 A few farms further down was William E. Tower (age 41) and his wife Emma (age 44). They had 4 children living at home, Bertha E. age 17, Youel L. (a son) age 15, Juanita G age 13, and Genevive O. age 11. Three farms further down, the census shows Major B. 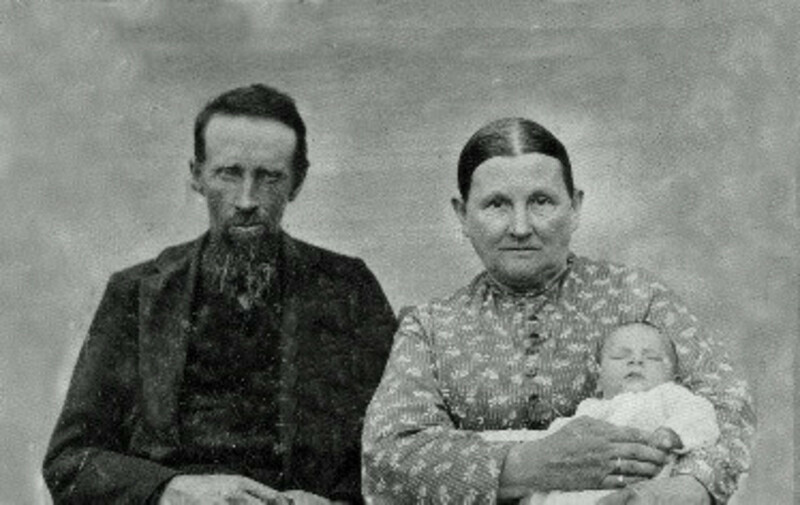 Tower (age 35) and his wife Addie L. (age 36) living with her parents John and Elizabeth Bernardi. The Bernardi family is American born but of German and Swiss ancestry. What Happened to Erastus Laban's Children? 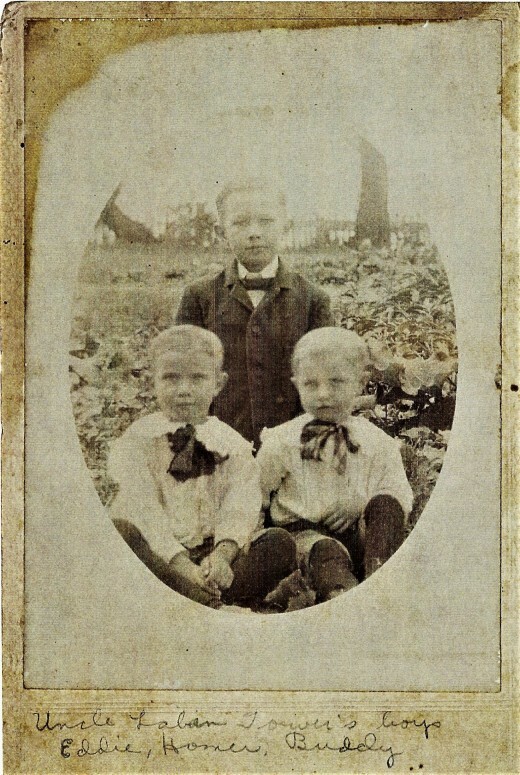 Their first child, Martha A. Tower was born August 1, 1887, but died a month later on September 1st. When William Edward "Eddie"Tower was born on March 2, 1889, in Indiana, his father, Erastus, was 27 and his mother, Clarvina, was 19. Eddie married Emma Ethel Carmichael on July 31, 1910, in Perry, Alabama. He had four children by the time he was 29. He died on May 31, 1960, in Louisville, Kentucky, at the age of 71. When Theodore Homer Tower was born on June 11, 1892, in Indiana, his father, Erastus, was 30 and his mother, Clarvina, was 22. He married Ilean Parr Riddle in April 1914 in Marion, Alabama. They had two children during their marriage. He died on July 25, 1977, in Louisville, Kentucky, at the age of 85. Their daughter, Hilda Marie Tower was born about 1915 in Alton, Indiana. She married Cledith A Anson. They had no children. She died on March 7, 2005, in Louisville, Kentucky, at the age of 90. Their son, Ray Tower was born in 1916, but died at the age of 4. Major Bernard Tower was born on March 28, 1895, in Jackson, Indiana, his father was 33 and his mother, Clarvina, was 25. He married Addie Lee Bernardi on February 26, 1915, in Indiana. They had two children during their marriage (Margaret V. and Glen E.). Later he married Flora T. Schmidt Nix. Major Bernard Tower died on August 15, 1975, in Evansville, Indiana, at the age of 80, and was buried in Perry, Indiana. When Dorris Clinton Tower was born on January 31, 1913, in Union City, Indiana, his father, Erastus, was 51 and his mother, Clarvina, was 43. He married Bethel Oakley but I haven't found any record of children. He died on February 12, 1978, in Evansville, Indiana, at the age of 65, and was buried in Perry, Indiana. I visited the Tell City Library in October 2012 which had a great genealogy room. 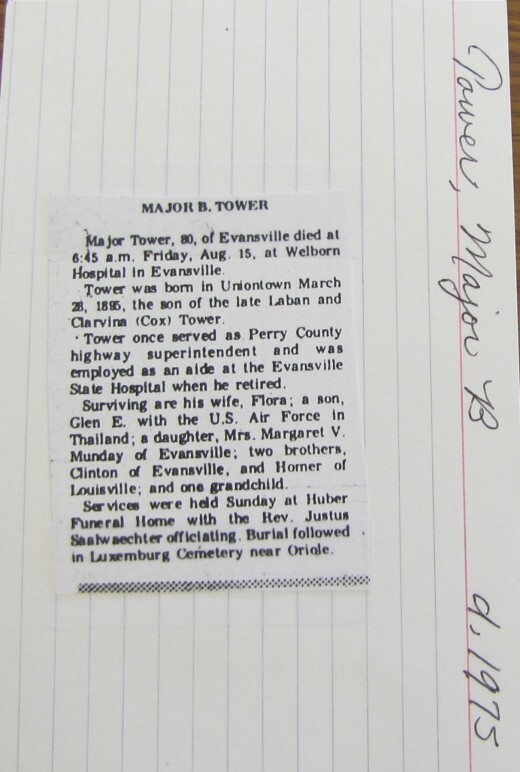 In the obituary file, I found Erastus Laban Tower, his wife Clarvina and their son, Major. In Laban's obituary, it mistakenly adds an "s" onto all the Tower names. Another mistake is the city where his brother William Tower lived. It should be Tyro, KS, not Tyno. I'll add to this gradually as I find more information. My mother gave me her genealogy notebook to review. There is a lot of information that I want to get online for others who may be searching for this family line. Are You Working on Your Family Tree? I have been gathering our family tree information to submit for my Daughters of the Revolution membership. We are fortunate that our ancestors kept good records. What you are doing is so very interesting.